Abergynolwyn is my current project. Having finally finished Clinkerford and before returning to my 'magnus opus' Worseter, I decided it might be pleasant to build a layout that would fit in the back of the car or the motor home. The logic being that it wouldn't take so long to build (Clinkerford was nearly twenty years, with a few breaks, from inception to completion), we wouldn't need to use the trailer to go to shows and it would be quick to erect and take down. I'd always fancied trying my hand at 7mm, but a 1500mm long baseboard seemed a bit restrictive so it had to be a 'little railway'. Many years ago, when I was probably still in shorts, I scratch built a model of the little Tallyllyn loco 'Dolgoch' out of balsa wood and cardboard - it was never a great runner! Perhaps now was the time to build a decent working model. A quick trip to the Tallyllin website confirmed that kits for the loco and some rolling stock were produced by Wrightlines were available through Keykits. 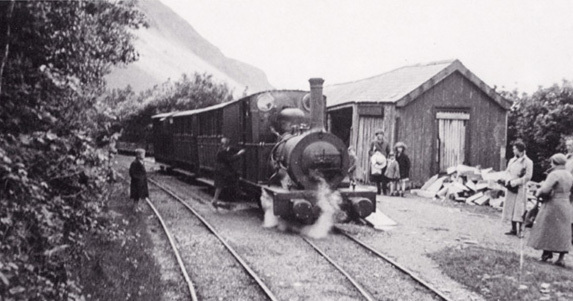 J.I.C.Boyd's excellent book on the Talyllyn Railway (Wild Swan PublicationsLtd.) was dusted off and the pages browsed for a suitably interesting location. 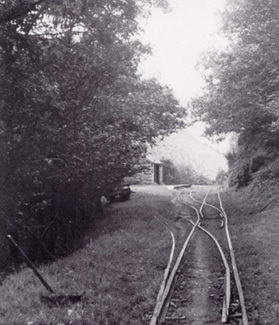 I wouldn't have enough room for Towyn and none of the intermediate stations offered much scope for operational interest so that left Abergynolwyn, the last stop on the line for passengers. Curving track set into the densely wooded hillside, a passing loop and the mineral line continuing on up the valley, it seemed to fit the bill nicely. Several weeks were spent gleaning information from track plans and photographs and transferring the results onto autocad.